Have you ever visited your favorite chain restaurant and noticed that they have funny t-shirts on sale? That’s one way they use to promote their business. Finding new and unconventional ways to market your business will surprise and delight your customers. Why should you consider raising your profile using promotional items t-shirts in the new year? If you’re running a small business, you may not have all the funds you need. Luckily, when it comes to promotional items, t-shirts have low printing costs. Although it’s tempting to create super elaborate designs, you don’t want your shirts to be too busy. After all, you don’t want to confuse or turn off any potential customers. Choose simpler logos and other designs and use at most three colors, so you don’t overwhelm the eyes. It’s simple enough to sell the promotional t-shirts to your customers or give them away through a contest. But if you are looking to build team spirit, then you can issue them to your employees and workers as well. It’s a smart welcoming gift for any new employees who are just now being brought onboard, as it can help them feel they belong in their new workplace. 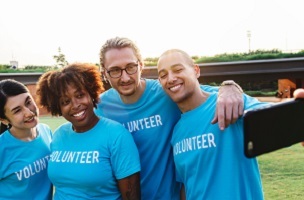 Having your employees wear t-shirts or collared shirts with the company’s name and logo on it at sponsored events or industry conventions is a great way to show solidarity. Whenever customers meet employees who are happy with where they work, it’ll lead to more conversions as that customers will think “I should visit their business or look them up online.” Once they decide to learn more, your website will also gain more traffic. Let’s say that you’ve recently rebranded. During this time, you need to make your audience more aware of what your organization is called now while encouraging them to stop using the old name. In this way, custom-made t-shirts can help build your brand. After all, that is the purpose of all promotional items. While your employees might only occasionally wear their work shirts outside of work, your customers will be proud to wear your shirt. That will help get your new name out there. Eventually, you will expand your customer pool and see sales start to go up. Whether you know already how your promotional items should look or you want further layout advice, Time Printers is here to help. We service all of Baltimore, Hunt Valley, and Towson. Our team of professionals can tackle all of your questions. Give us a call at 410-566-3005 and be sure to follow us on Facebook, Twitter, Google+, Pinterest, and LinkedIn for tips and to see what we have been working on and what we can do for you. This entry was posted on Friday, January 18th, 2019 at 10:53 am	and is filed under Promotional Items. You can follow any responses to this entry through the RSS 2.0 feed. Both comments and pings are currently closed.